BECCA Shimmering Skin Perfector Pressed Highlighter Mini Macaron Set in Opal, Vanilla Quartz, Rose Quartz, & Prismatic Amethyst. With Shimmering Skin Perfector Luminous Blush in Snapdragon. 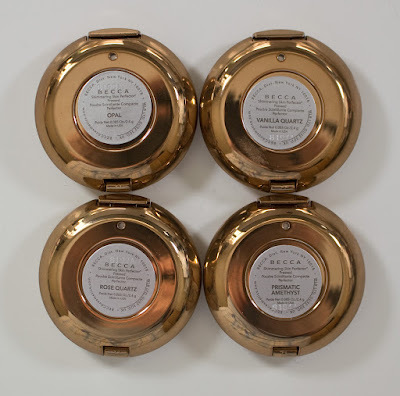 The BECCA Shimmering Skin Perfector Pressed Highlighter Mini Macaron Set retails for $40US and $48CAN for 4 x 0.085 oz/ 2.4 g of product. This set is just a tiny bit more in price compared to one full-size blush if you're looking for more shades to work with. BECCA Shimmering Skin Perfector Pressed Highlighter Mini Macaron Set in Opal, Vanilla Quartz, Rose Quartz, & Prismatic Amethyst. Box art sides. BECCA Shimmering Skin Perfector Pressed Highlighter Mini Macaron Set in Opal, Vanilla Quartz, Rose Quartz, & Prismatic Amethyst. Box art top and bottom. BECCA Shimmering Skin Perfector Pressed Highlighter Mini Macaron Set in Opal, Vanilla Quartz, Rose Quartz, & Prismatic Amethyst. 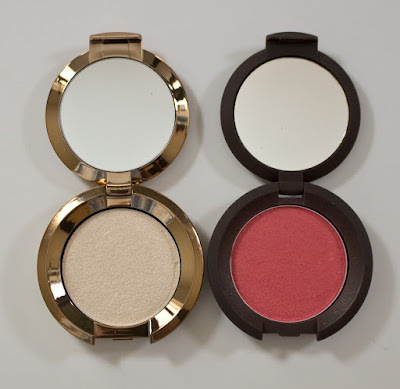 BECCA Shimmering Skin Perfector Pressed Highlighter Mini Macaron Set in Vanilla Quartz and Shimmering Skin Perfector Luminous Blush in Snapdragon. BECCA Shimmering Skin Perfector Pressed:Talc, Caprylic/Capric Triglyceride, Isostearyl Alcohol, Petrolatum, Silica, Boron Nitride, Nylon-12, HDI/Trimethylol Hexyllactone Crosspolymer, Dimethicone, Paraffin, Microcrystalline Wax, Tin Oxide, Polyethylene, Magnesium Stearate, Sorbitan Sesquioleate, Calcium Sodium Borosilicate, Synthetic Fluorphlogopite, Triethoxycaprylylsilane, Calcium Aluminum Borosilicate, Polyethylene Terephthalate, Acrylates Copolymer, Tetrasodium EDTA, Chlorphenesin, Potassium Sorbate. 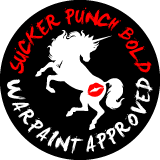 May Contain (+/-): Titanium Dioxide (Ci 77891), Iron Oxides (Ci 77491), Mica, Iron Oxides (Ci 77499), Iron Oxides (Ci 77492), Carmine (Ci 75470), Manganese Violet (Ci 77742), Ultramarines (Ci 77007), Yellow 5 Lake (Ci 19140), Ferric Ferrocyanide (Ci 77510), Chromium Oxide Greens (Ci 77288), Chromium Hydroxide Green (Ci 77289), Bismuth Oxychloride (Ci 77163), Aluminum Powder (Ci 77000), Blue 1 Lake (Ci 42090), Bronze Powder (Ci 77400), Red 40 Lake (Ci 16035). The texture on these BECCA Shimmering Skin Perfector Pressed Highlighter Mini Macaron is buttery with even shimmer when applied to the skin. The formula also does a nice job of applying evenly, but you can still defuse the shades on the skin without going patchy. I did fin the shades Opal and Vanilla Quartz to be slightly more shimmery and powdery compared the original, but they almost look identical on the skin when you apply them normaly. The Luminous Blush in Snapdragon is a smooth satin-matte formula with micro shimmer that can be applied sheer and build up as needed. Opal is described as golden opal pearl but the tone is much more of a beige gold refined shimmer. Vanilla Quartz is a white base pale gold with a slight pink shift and a shimmer finish. Rose Quartz is a white base pale lavender with a slight gold shift and a shimmer finish. Prismatic Amethyst is a white base pale lavender with slight gold shift and a shimmer finish. Snapdragon is a deep pink coral with a gold shimmer finish. 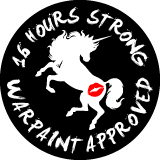 On the cheeks, it lasts 12 hours before noticing any fading but the colour is still there after 16 hours. The Shimmering Skin Perfector Pressed Highlighter Mini Macaron Set compacts is gold mirror finish with a metal medallion with the Becca logo on it. They also have a mirror inside the lid. 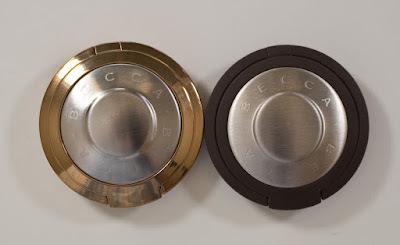 I found the packing weight of these compacts to be slightly heavier then their classic rubber rubberized dark brown one. 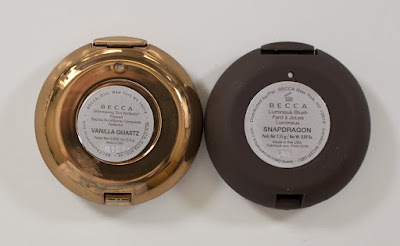 The compact for the Shimmering Skin Perfector Luminous Blush and original Pressed Highlighter is rubberized dark brown with a metal medallion with the Becca logo on it. It also has a mirror inside the lid. Daylight swatches: BECCA Shimmering Skin Perfector in Opal, Vanilla Quartz, Rose Quartz, & Prismatic Amethyst, applied heavy and light. 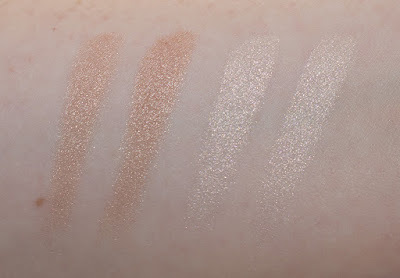 Flash swatches: BECCA Shimmering Skin Perfector in Opal, Vanilla Quartz, Rose Quartz, & Prismatic Amethyst, applied heavy and light, applied heavy and light. 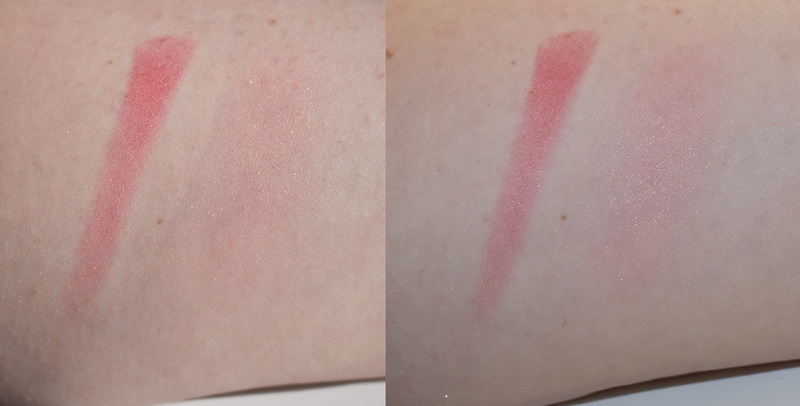 Daylight & Flash swatches: Shimmering Skin Perfector Luminous Blush in Snapdragon, applied heavy and light. 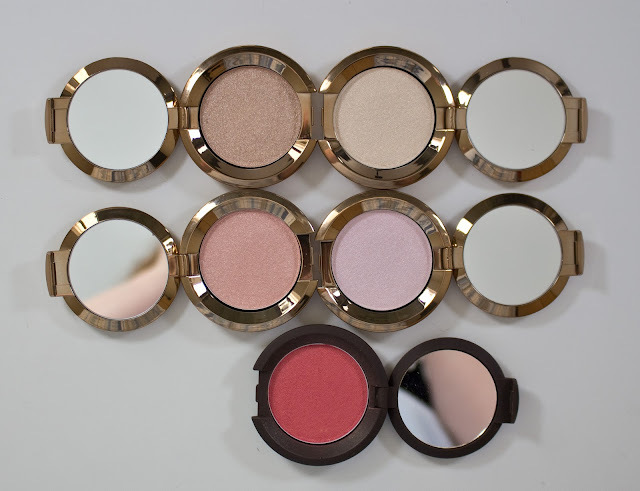 BECCA Shimmering Skin Perfector in Opal from mini set and original mini. 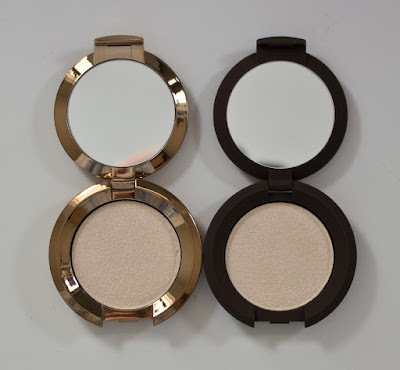 BECCA Shimmering Skin Perfector in Vanilla Quartz from mini set and original mini. 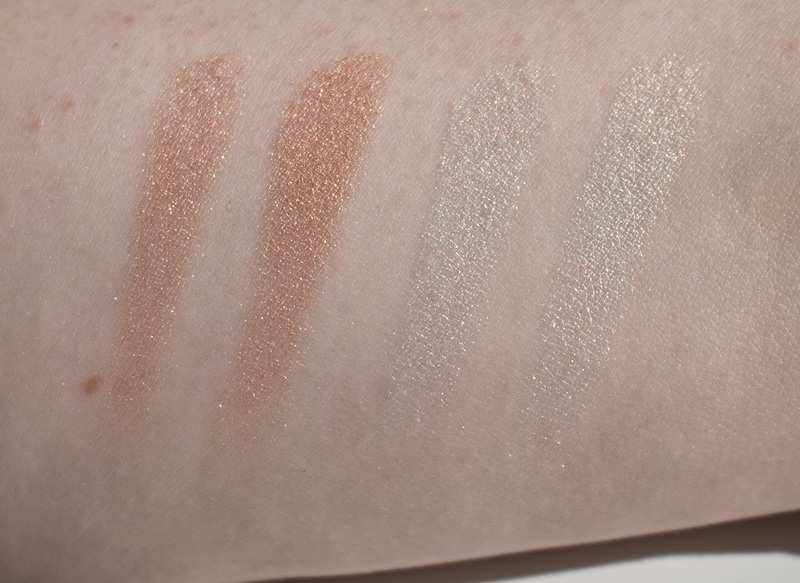 Daylight swatches: Opal from the mini set and original mini and Vanilla Quartz from the mini set and original mini applied heavy and light. Flash swatches: Opal from the mini set and original mini and Vanilla Quartz from the mini set and original mini applied heavy and light. BECCA Shimmering Skin Perfector in Opal from mini set leans more gold and a little less pink compared to the original mini I own. 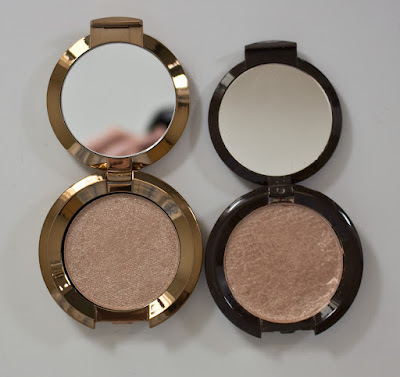 BECCA Shimmering Skin Perfector in Vanilla Quartz from mini set leans slightly pinker compared to the Original mini I own and what I've seen in the Sephora stores with the full size one. 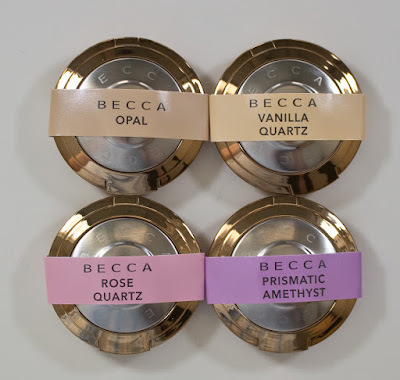 For the BECCA Shimmering Skin Perfector Pressed Highlighter Mini Macaron Set, if you're like me and didn't want to buy a full-size Rose Quartz, and Prismatic Amethyst but still kind of wanted them this a great set if your pale to medium skin tone as Vanilla Quartz and Opal work with those skin tones. 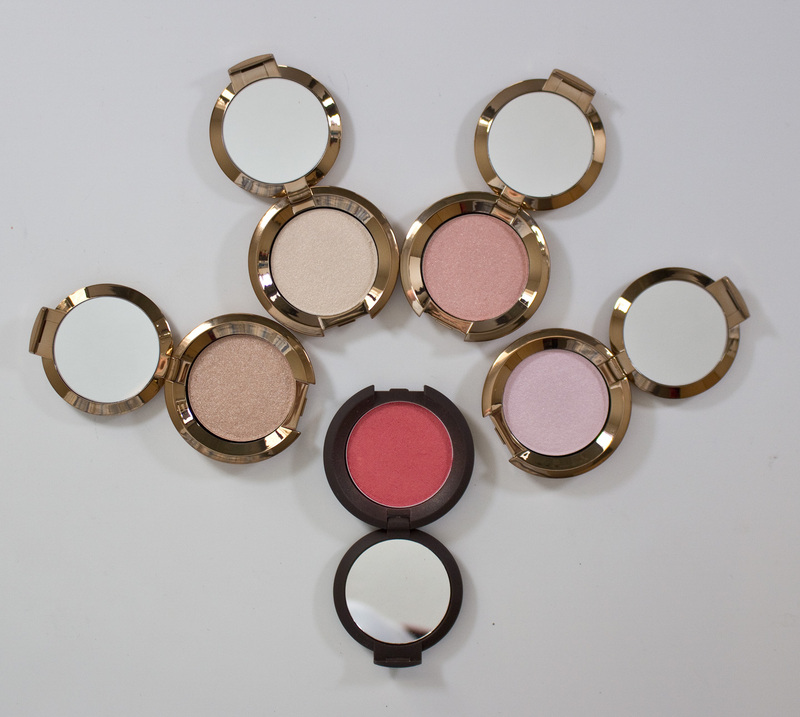 The Shimmering Skin Perfector Luminous Blush in Snapdragon is lovely for my pale skin but it is buildable up to medium skins tones.